Mix the flour, sugar and salt very well in a bowl. Shred about 1/3 of the cold butter into the flour mixture and toss to coat. Continue shredding butter and tossing. Using a pastry cutter or your fingers, work the mixture into a coarse meal. Add about 3 tablespoons of water and mix with a heavy scraper. Keep adding water until dough comes together. Dump the mixture onto a pie mat, then press into a block, wrap in plastic, and chill for at least 30 minutes (preferably longer). While dough is resting, make the streusel. Combine all dry ingredients, then stir together melted butter and vanilla and pour over. Stir until crumbly and put in the refrigerator until ready to use. Now make the filling. Pit and stem the cherries, breaking the cherries in half by hand as you pit. Put the now pit-free cherries in a mixing bowl, then toss with tapioca. Add the sugar and stir to coat (it may seem like a lot), then stir in the lemon juice and both extracts. Allow the filling to stand for a full 20 minutes. This step is important because it softens the tapioca and keeps it from being lumpy in the baked pies. Preheat oven to 425 degrees F. and have ready a rimmed baking sheet. To make the pies, cut your dough block into 4 sections (3 oz each) and take out two sections. Keep the remaining sections refrigerated. Cut each section in half so that you have four 1 1/2 oz pieces. Roll or press each piece into a circle a little over 3 inches and press into and slightly up sides of the pie shell. You don't need it to go all the way up, just about 1/2 or so. Also, it doesn't need to look perfect because it will be completely covered up. Divide the filling among the 4 pie tins, then sprinkle tops with streusel. You can sprinkle all four with streusel or you can sprinkle just two with streusel and use another section of dough to make two lattices. .
See note if making lattices. Set on a rimmed baking sheet and bake at 425 for 10 minutes. Reduce oven temperature to 375°F and bake for about 20 minutes or until tops are golden brown. Transfer pies to rack and cool completely. 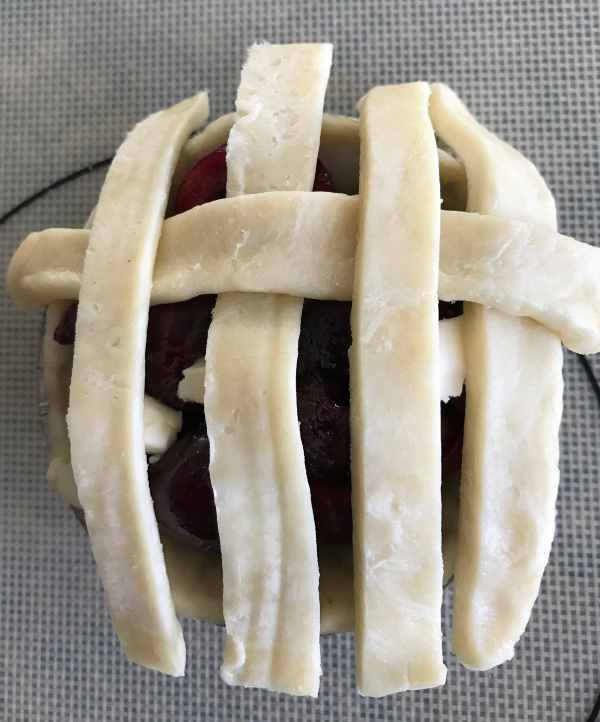 If you want to make lattice pies, take out 1 section of dough (3 oz) and on a well floured surface, roll it into a rectangle that is about 4 inches high and 6 inches or as wide as you can get it. Using a pizza cutter, cut int o 16 strips. You''ll use 8 strips for each pie. Lay 4 strips lengthwise on a pie, then weave 4 strips crosswise. Tuck the ends in and squish them down as neatly as you can. The squished dough will help absorb juice and keep the pies from running over quite so much. If you are making lattices for all four pies, repeat with the last 3 oz section of dough to make two more tattices.